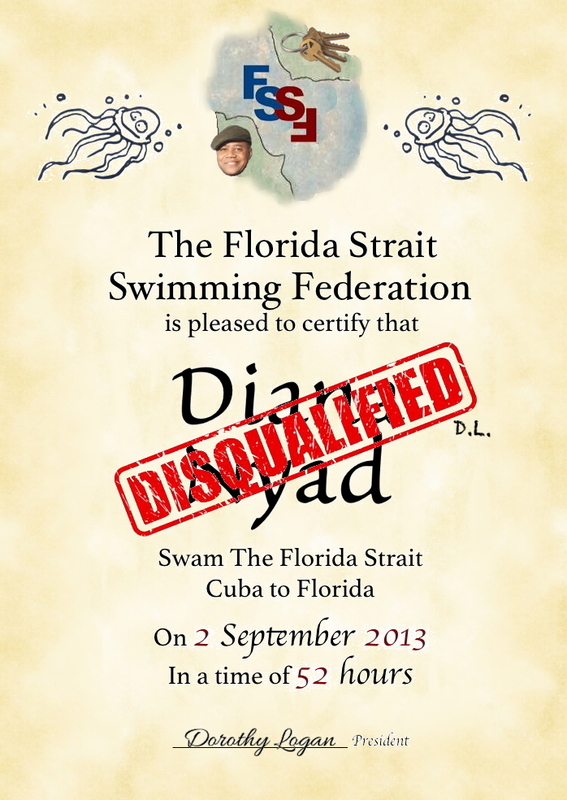 By the rules that Diana Nyad and her own team set forth, we can declare her 2013 Cuba-Florida crossing invalid. The missing manual. Jellyfish courtesy of Lynn Kubasek. “I honored the rules,” Nyad told David Adams of Reuters a week after she completed her Cuba-Florida crossing (“Questions Linger….”). But what rules did she honor? “Trust me,” she said in a Facebook post, “this dream [is] too important to me to have any slight thing outside the fair, just, ethical and agreed-upon rules of our sport” (screenshot here and below). We still have no idea what Nyad was talking about. [S]he was following “Florida Straits Rules” during her swim, written for her by [Steven] Munatones, a respected international swimming expert and former observer on three of Nyad’s previous failed attempts to swim the Florida Straits…. 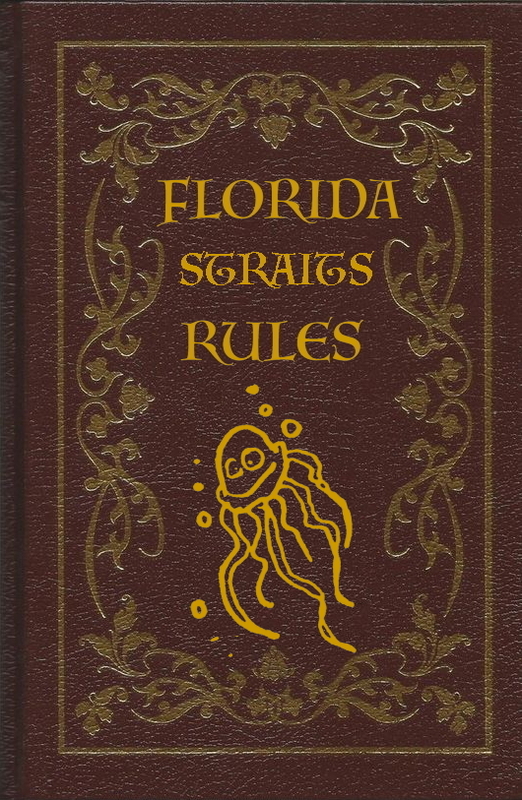 …Munatones said he would be distributing copies of the “rules of engagement” for the Florida Straits to the media and the swimming community. In other words, Diana was creating the rules on the spot. Or Steven Munatones wrote them out ahead of time. Or maybe some combination of the two. Who knows! Whatever it was, here we are over five years later, and those “rules of engagement” still haven’t materialized. Nyad may have gone out of her way to avoid the shackles of written rules, but that doesn’t mean she never articulated a single one. As a matter of fact, she and members of her team did articulate a single one. Proclaiming it multiple times during and after her crossing, she and her crew affirmed the cardinal rule of marathon swimming: No touching! Below is a chronological list of the times they claimed to be abiding by the rule, as well as the times Diana conceded that she broke it. One thing, though, before we get to the list. If you’re familiar with Diana’s oeuvre, you may have noticed a pattern: When she desperately wants to be #1—say, the first person to complete an unassisted swim across the Florida Strait or the first woman to swim around Manhattan Island—she lies to make it so. When she gets caught, she prevaricates, makes excuses, then grudgingly scooches over to make a bit of room for the facts. Finally, following a period that Diana deems acceptable—a few months for Manhattan, less than a week here—she chucks the truth overboard and returns to the lie. “Nobody can touch her until she’s out of the water” (Bonnie Stoll). “It was very important that no one touch me ’cause you’re disqualified. “I never of course touched a boat or another person” (screenshot of Facebook post). But the next day, in a conference call staged by Steven Munatones, with Diana’s “peers” playing inquisitors, she finally told the truth. “[No] handlers grabbing my ankles. I was on my own steam entirely. “I go with the shark divers. They’re never allowed to touch me. Ever! But the no-touch rule only makes sense if it applies to the entire swim. Nyad’s dramatic slog onto the Florida sand, therefore, was just a performance. She and Steve knew that press and peers would be watching, so Diana cleaned up her act for the final scene. Nyad’s selective application of the no-touching rule explains the disappearance of photos and video from the endeavor. Any visual evidence would likely reveal that her crew touched her more often than she lets on. Not to mention that we still lack definitive proof that Nyad swam the entire distance under her own power. Presumably, the missing film and images would prove things one way or the other. Without those revelations, however, we still have enough evidence to make a determination on the validity of Nyad’s crossing. During Diana Nyad’s 2013 Cuba-Florida attempt, she and her team declared a single rule, the cardinal rule of marathon swimming: touching means disqualification. She broke that rule throughout her attempt. Therefore, in accordance with Diana Nyad’s own stated directives as well as those of her crew, we consider her 2013 Cuba-Florida swim invalid. Disclaimer: The Florida Strait Swimming Federation is a product of the author’s imagination. It is as fictional as many of Diana Nyad’s claims about her life and her swimming career. Any resemblance of the FSSF to actual organizations past or present is purely coincidental. Jellyfishes again courtesy of Lynn Kubasek. What did it for me, while I was following this charade online, was her crew’s comment about her “coming in for the first time in 7 hours for feeding” or something like that. And I think that was after the second night. I immediately waved the BS flag, unable to imagine anyone at that point of such a long swim going all night without at least water. Then those posts disappeared. Then I knew it was all a sham. For what it’s worth, I think you can still find those comments, or at least a version of them, here: Doctor’s Report 715am – 730am. Diana has gotten very cold, so the handlers were not stopping her to eat and drink overnight in the hopes that swimming would keep her warm. Additionally it was difficult to get her oriented to the boat and where to go in the dark. And yet she manages to barrel toward Florida. …the whistle blew for Diana’s first feeding stop since before midnight, it took her longer than normal to reach Voyager…. Whether the above bears any resemblance to the truth probably doesn’t matter. Most of the people accompanying Nyad clearly knew nothing about marathon swimming. I’m guessing that Nyad depended on their ignorance in order to get away with whatever she got away with.